This trip had a strange beginning. 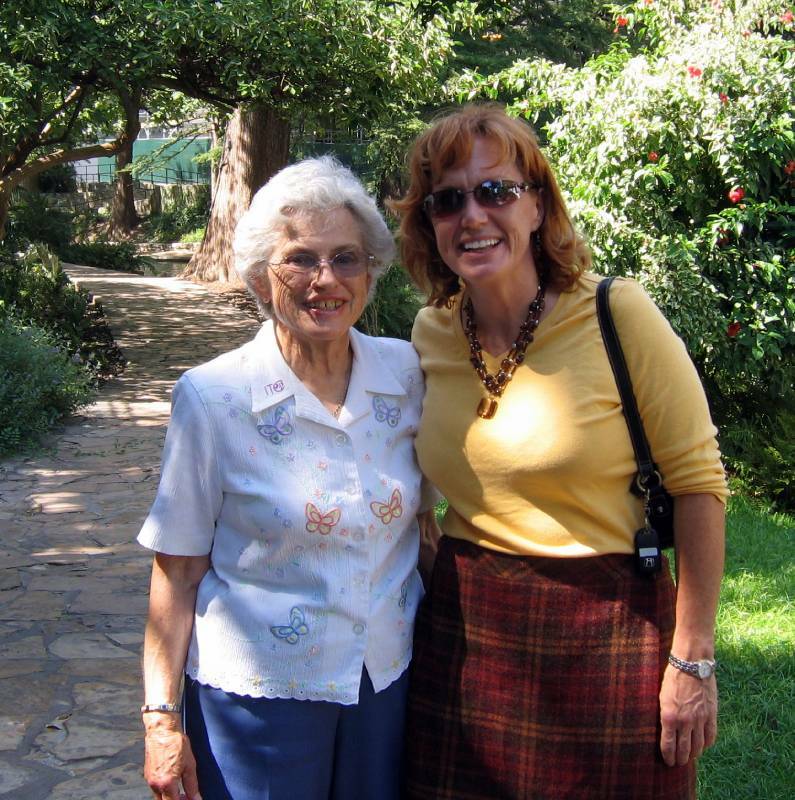 It all started when we registered for an ELDERHOSTEL PROGRAM that was to last for 5 days in San Antonio. We decided that we would extend our stay by another 5 days to explore some more of the area on our own. And so, we purchased our airline tickets, and waited for the big day to arrive. Then, much to our surprise, we received a message from Elderhostel telling us that the program was canceled because insufficient customers had registered. Dealing with the airlines would be daunting, and so we decided to keep the tickets and do the 10 day trip all on our own. 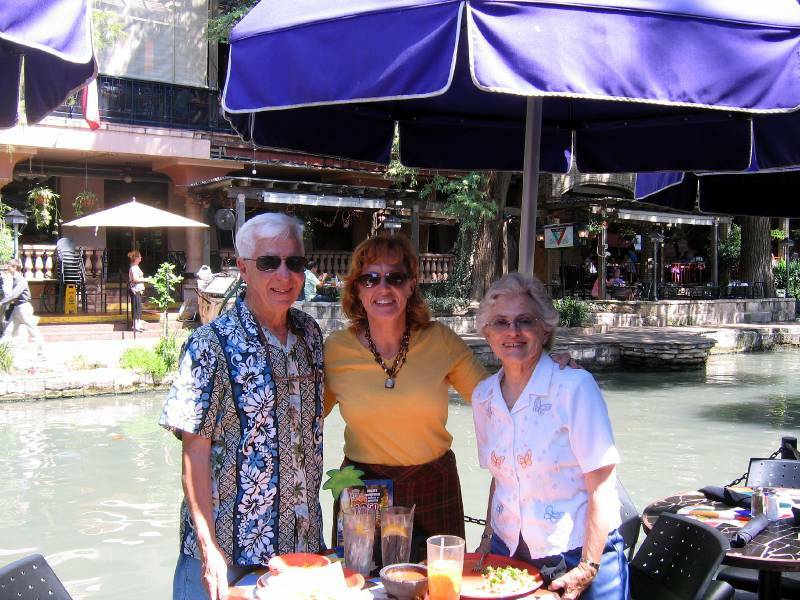 The basic plan was to spend several days walking around San Antonio, then rent a car, and drive in a large loop around that part of Texas, retuning to San Antonio for the flight home. -- So here we go! 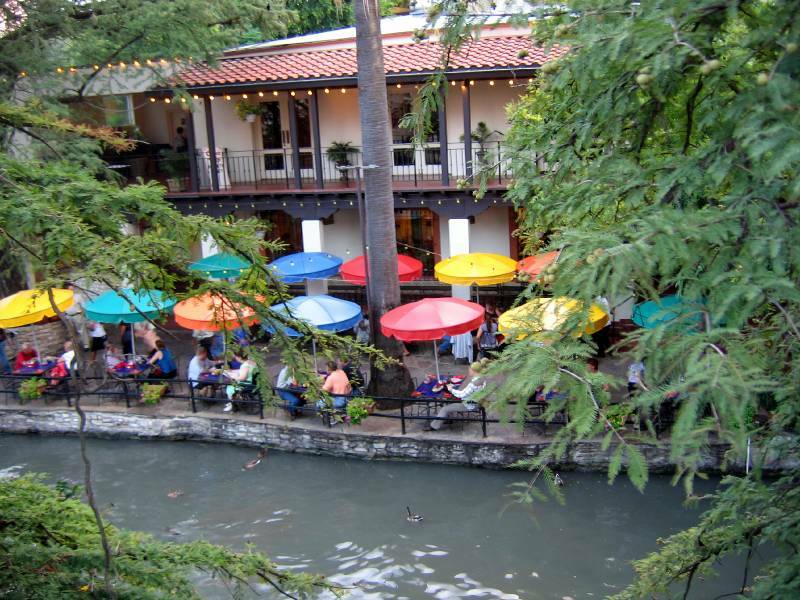 A well known highlight of San Antonio is the "RIVER WALK", and so we chose a delightful , small historic downtown hotel that was centrally located one block from the River Walk. We checked in around 3 PM, without lunch, and headed for the walk hoping to find some food, but I was in such a rush that I totally forgot to take the camera on that excursion. 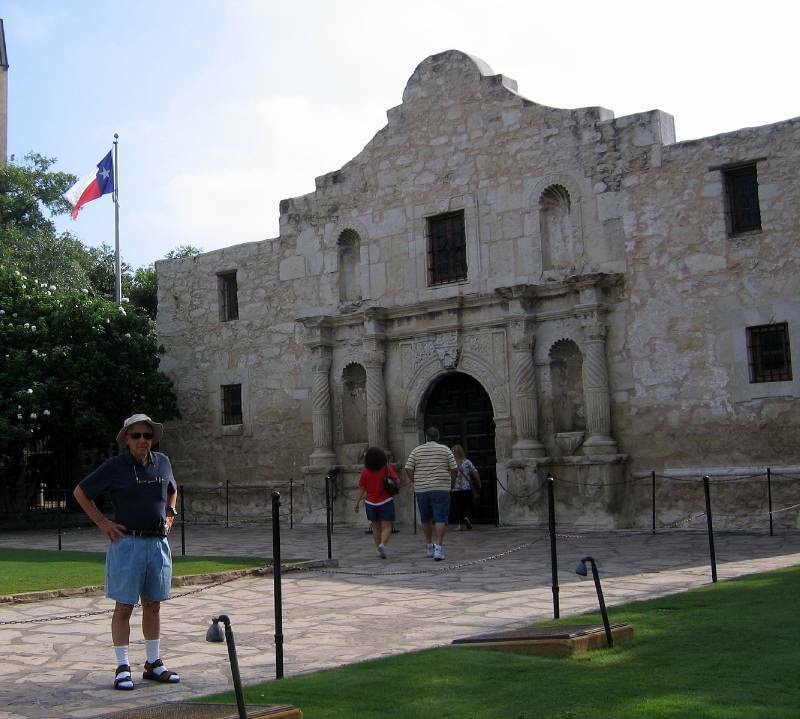 Later, we went back to the hotel, rested and got the camera and set out once again to explore - heading for the Alamo. It was pretty dark and so we planned to come back the next day. Here is restaurant where we ate yesterday -- yummy! The sources of the river are in a huge underground aquifer. 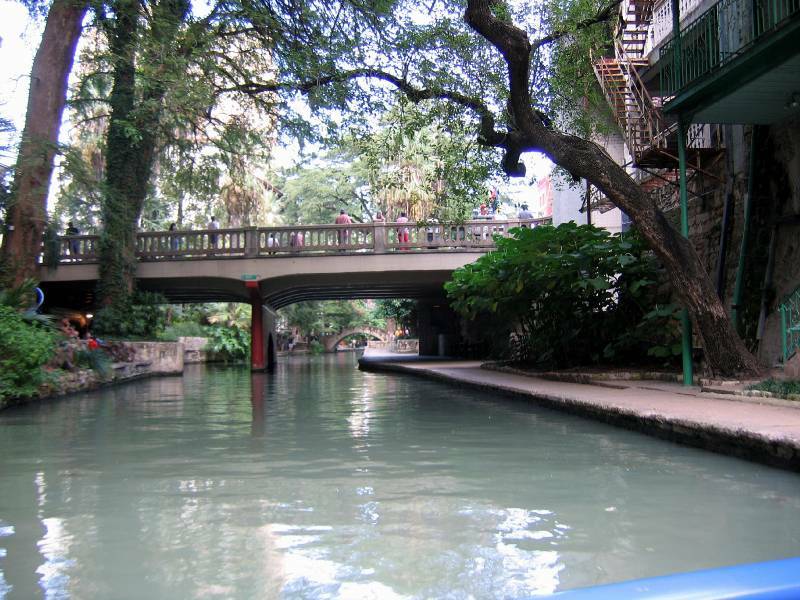 The river flows into San Antonio, and makes a large loop through the downtown, passing near the Alamo. It caused some flooding on occasion, and part of the fix was to dig a channel across the neck of the loop, put up some special movable dams to keep the high water out of the loop, letting it go across the channel and bypass the downtown loop. Someone had a beautiful vision, and soon they started putting in the paths all along the river, and soon restaurants came. Then they set up a fleet of these neat passenger boats to provide a sightseeing cruise around the loop. It is very well run and the price was very reasonable - less than $5 for seniors if my senior memory is still working. I had Marie pose by this huge tree to give some idea of the size. 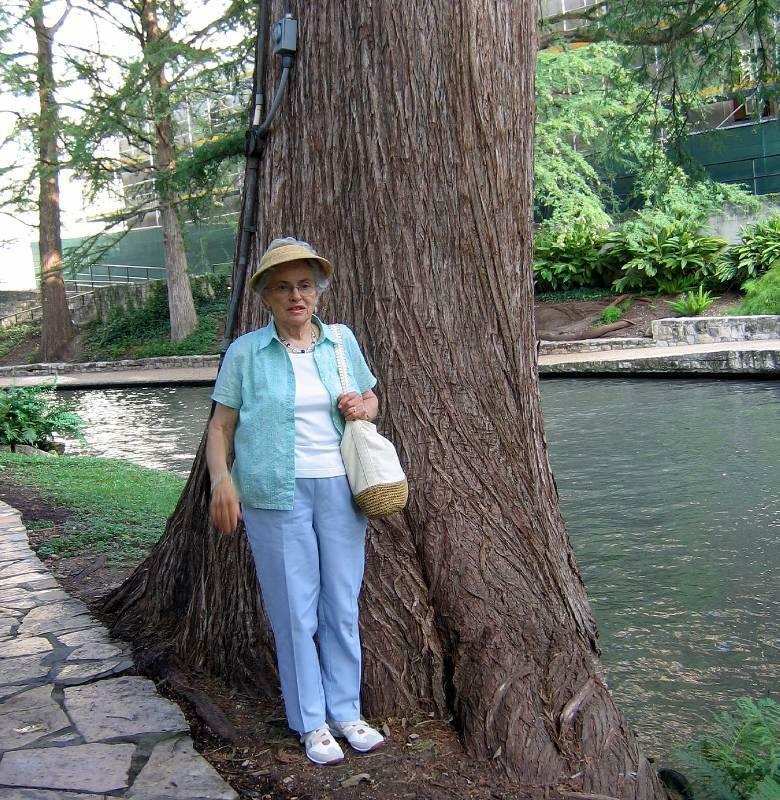 I could not believe that there were so many of these beautiful stately cypress trees. I thought that the early settlers would have cut most of the trees down, but thankfully there they are! 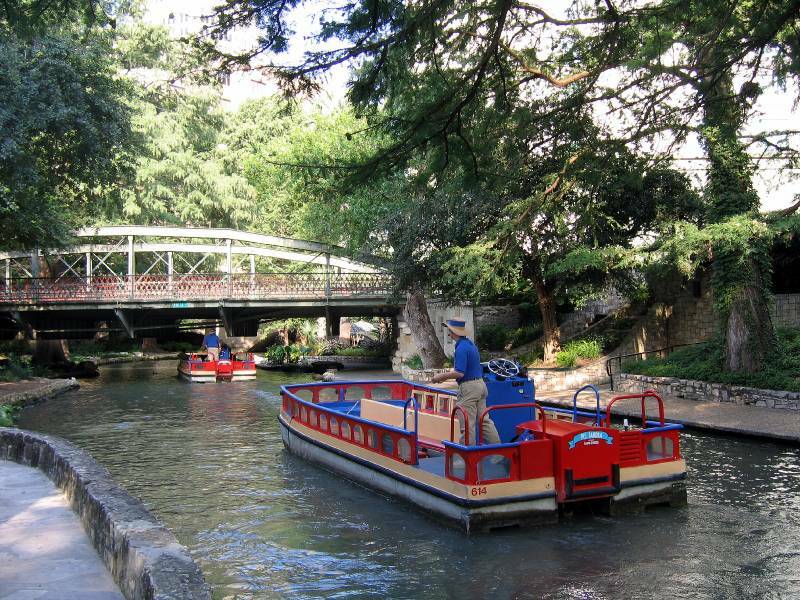 To me, they are a major feature of the River Walk. 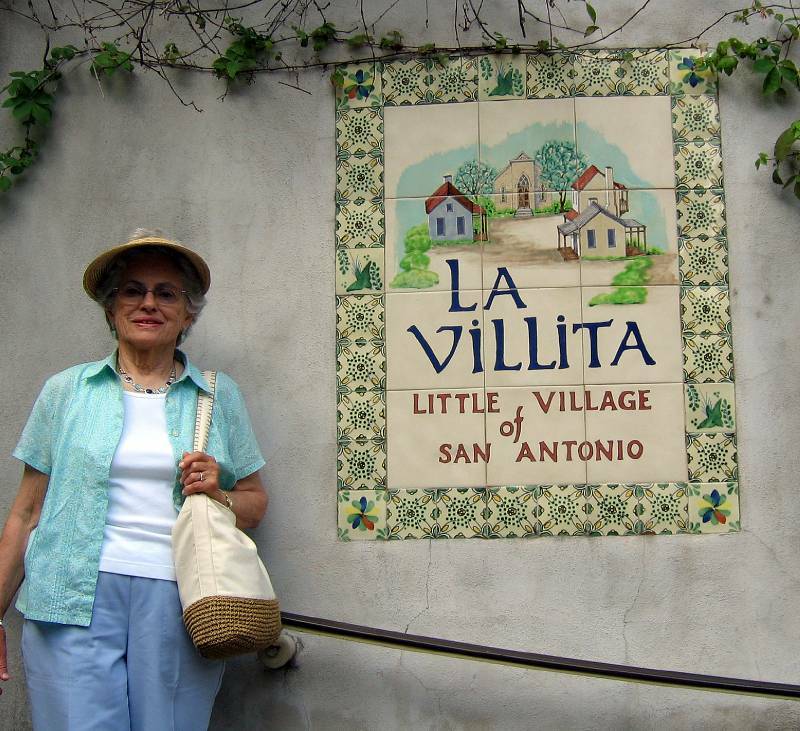 Near to the river is a restored district called La Villita. 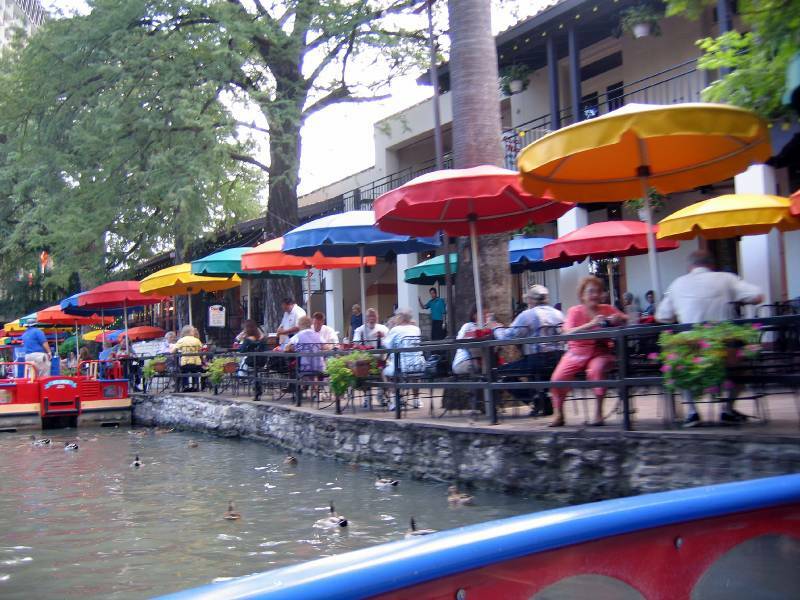 There are many arts and crafts shops, restaurants and restored historic homes. The boat operator is giving a running description and history of the river area. 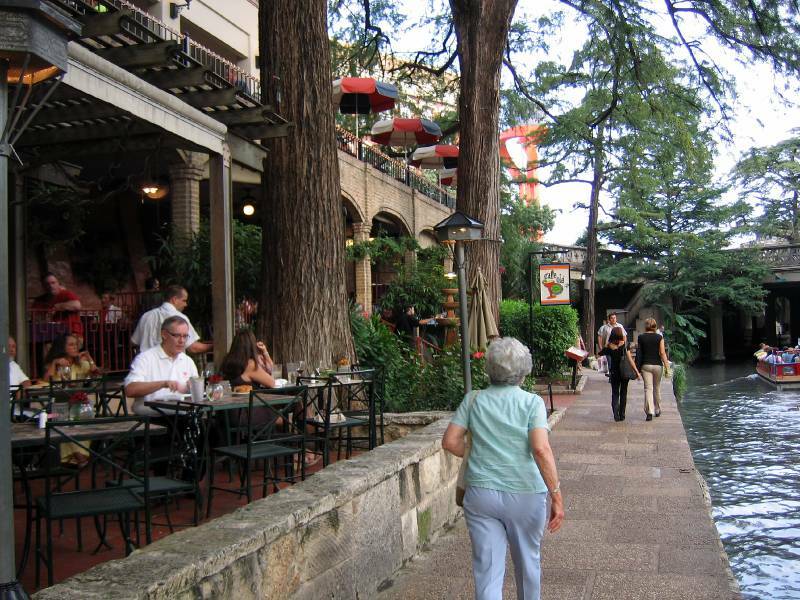 There are a couple of high end hotels that are literally on the River Walk. Our taxi driver who drove us from the airport to our hotel scoffed when we reported it's location as being very close to the river, quipped that "all the hotels say they are by the river"
Well, as I promised, we returned to Alamo the next day. This was the Mission Church in the very early days. The inside is nicely restored, but not as a church. 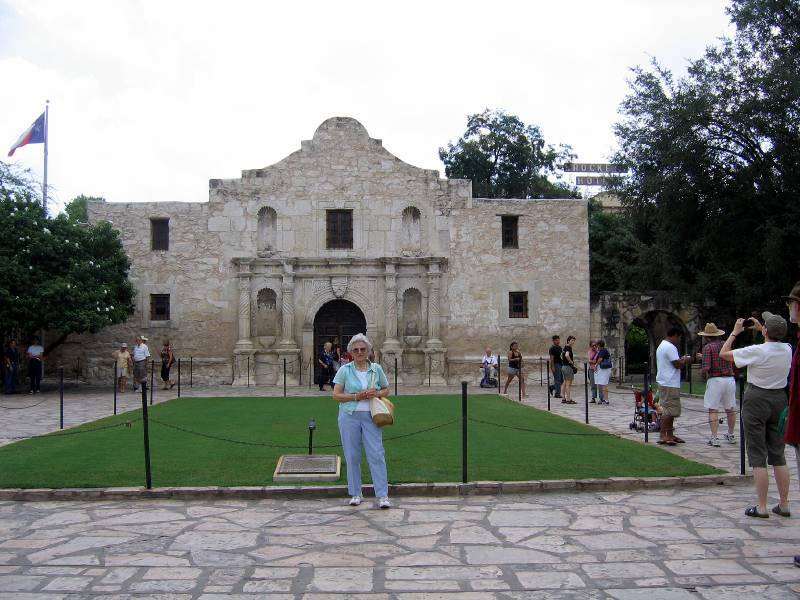 The Alamo is on a very large walled piece of ground, with a number of buildings and courtyards. One of the buildings was a barracks building which had many wonderful artifacts beautifully displayed. There was also an excellent movie. 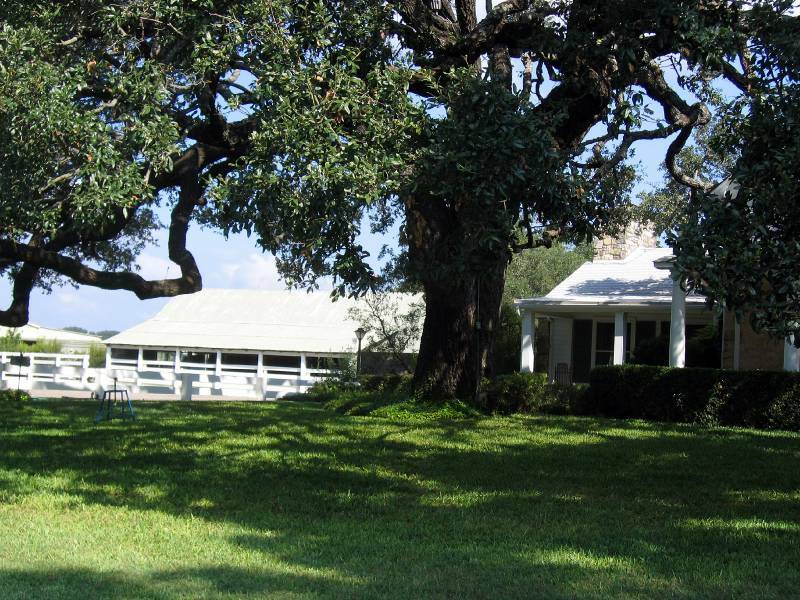 There is an absolutely huge Texas Live Oak in one of the court yards. It was transplanted there in the early 20th century by a devoted citizen. Everyone said that it would not survive, but it sure did. 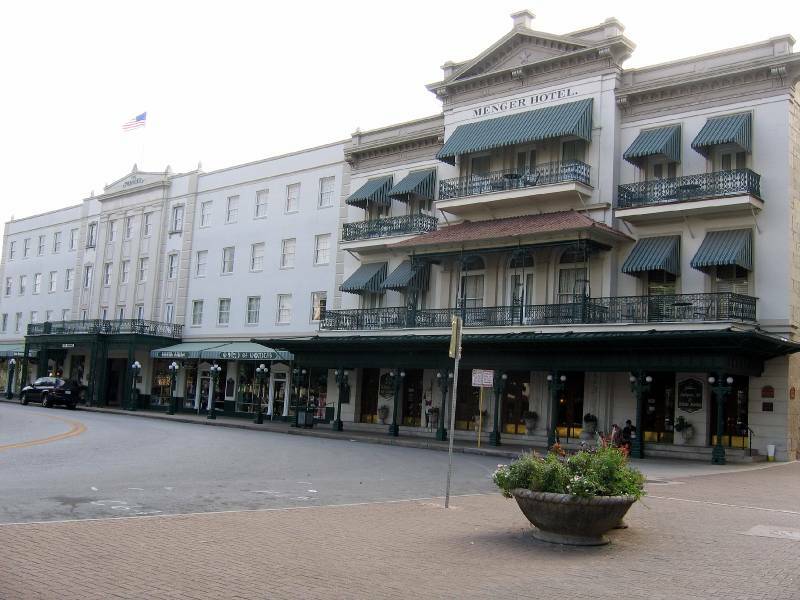 This is the Menger Hotel, which is just across the street from the Alamo. It is the oldest hotel, and is a National Landmark. 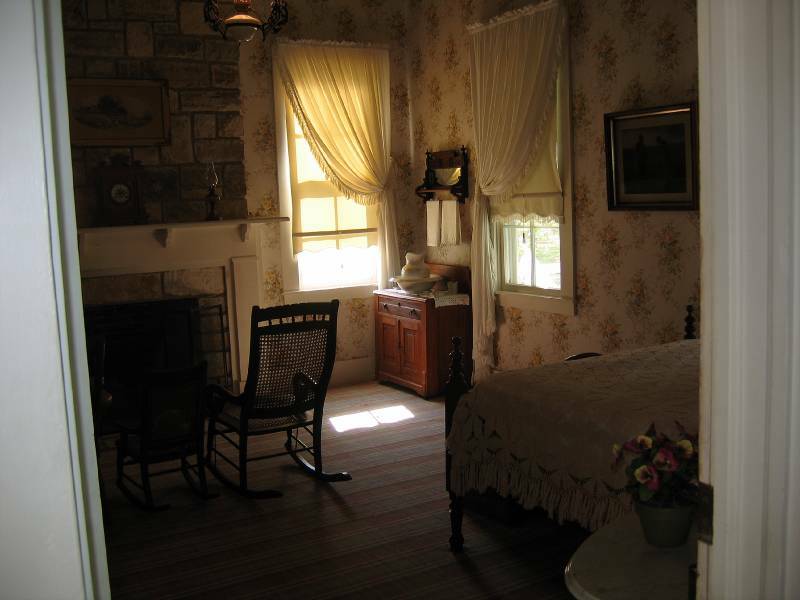 Many famous people have stayed there including presidents, governors, generals, etc. Tom and Julie stayed there on a recent motor trip because it is reported to be "haunted". It was fun to explore, and we found a Hagen Daz Ice Cream shop which we haunted! We had the detailed list of activities that the Elderhostel planned to do, and we were intrigued by a restaurant that they planned to visit for lunch. 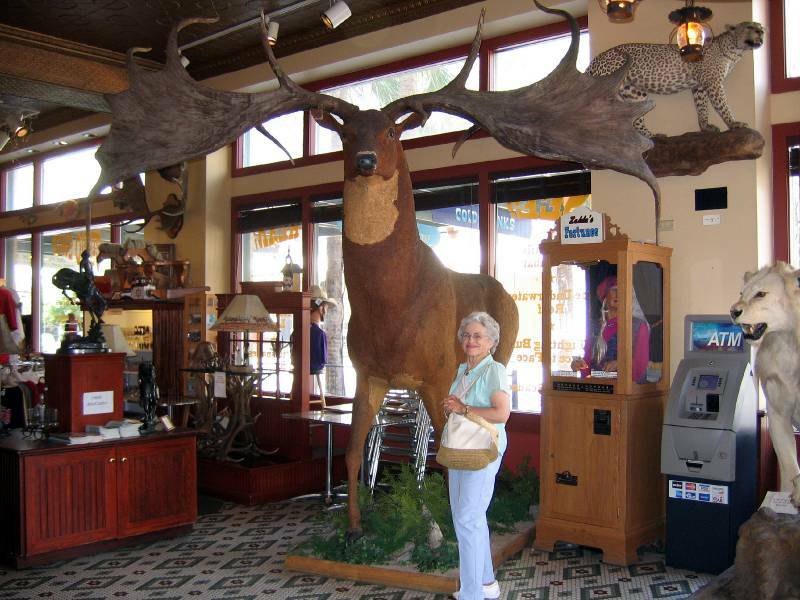 It is called "The Buckhorn Saloon and Museum", and is located only a few blocks from the Alamo. So guess where we went for lunch? 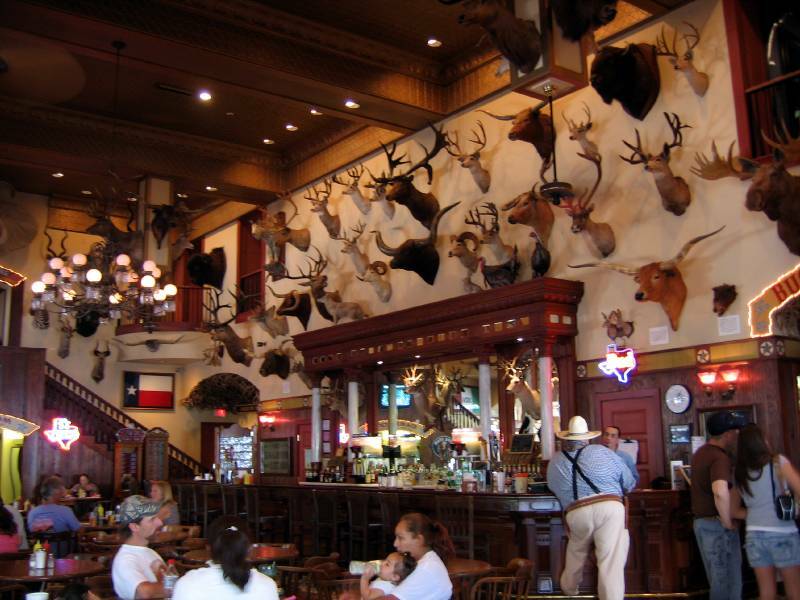 As you can see, it has a huge collection of mounted heads, as well as great beer and Texas Barbecue. I had the barbecue brisket sandwich, and it was the best I ever had. Just look at the size of those antlers! o you think he took steroids? 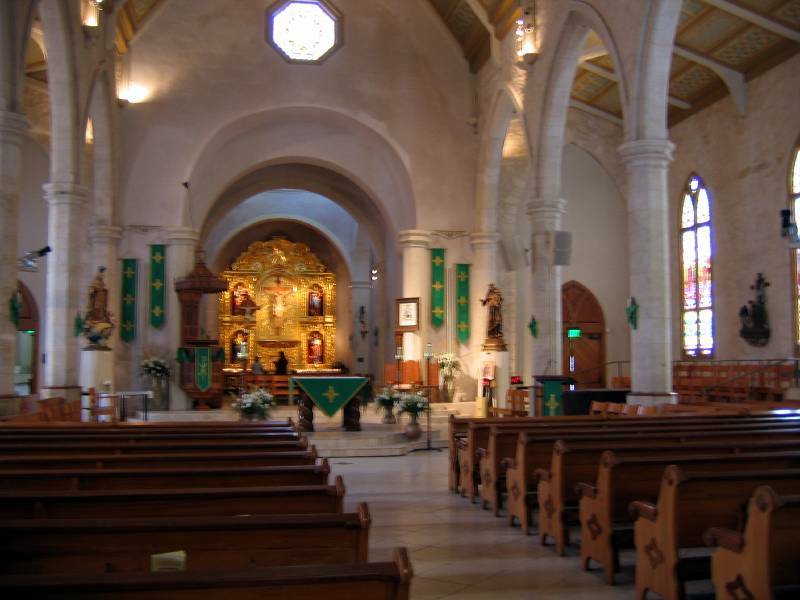 Next we walked to the San Fernando Cathedral, which was very beautiful. There was a lot of street construction in front of the church, and I was unable to get a good outside shot. 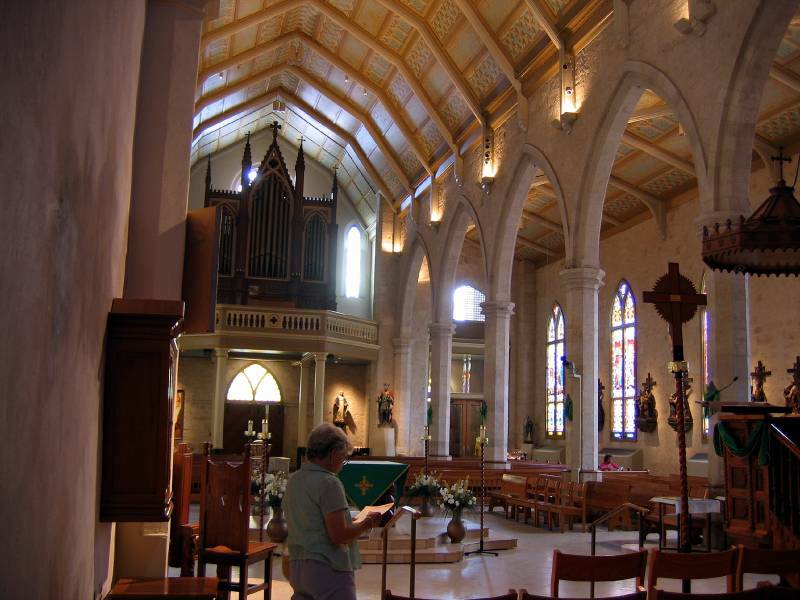 The church is very old, and, as a matter of fact, the sacristy, seen at the front , is the oldest cathedral sacristy still in operation in the USA. 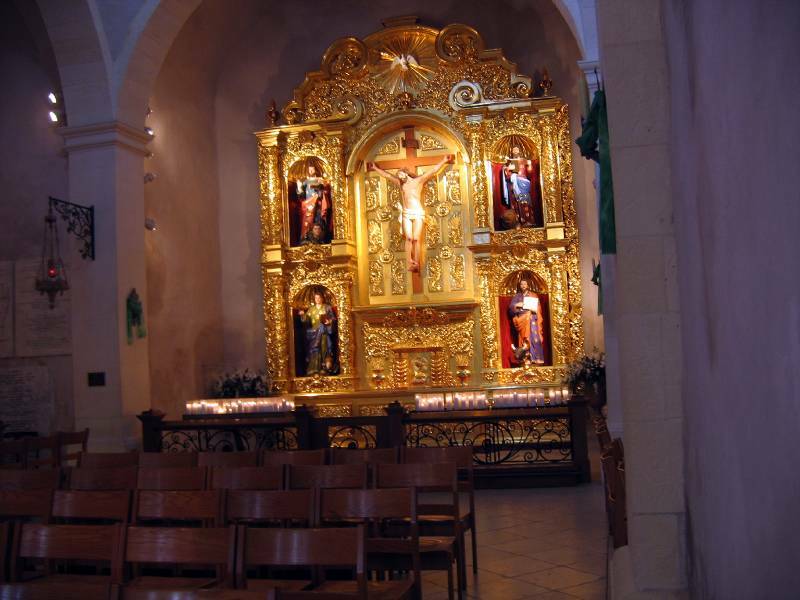 Here is a closer view of the sacristy. Later that afternoon we took a ride on one of the boats. It was very nice. Cruising along as the dinner time approaches. 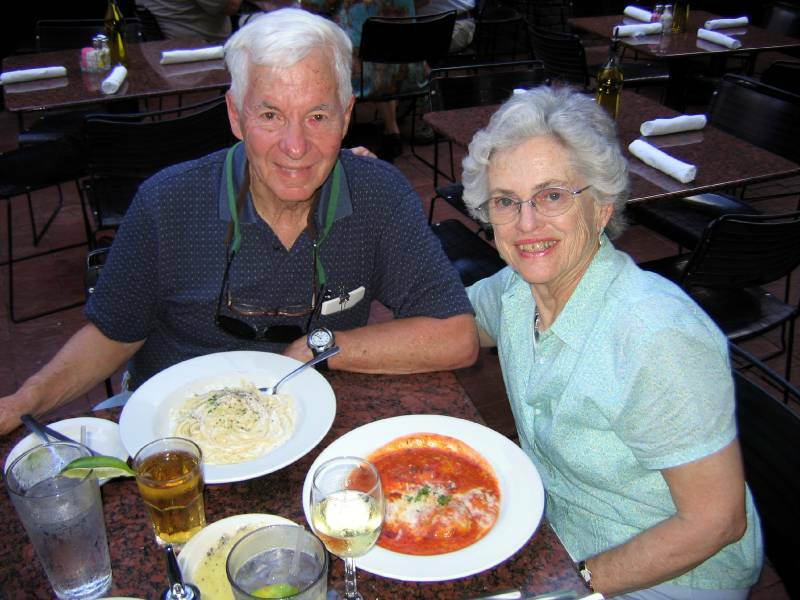 We ate in a nice Italian restaurant right on the River Walk. Yummy! Activity picks up as the day wanes. Walking back toward the hotel. 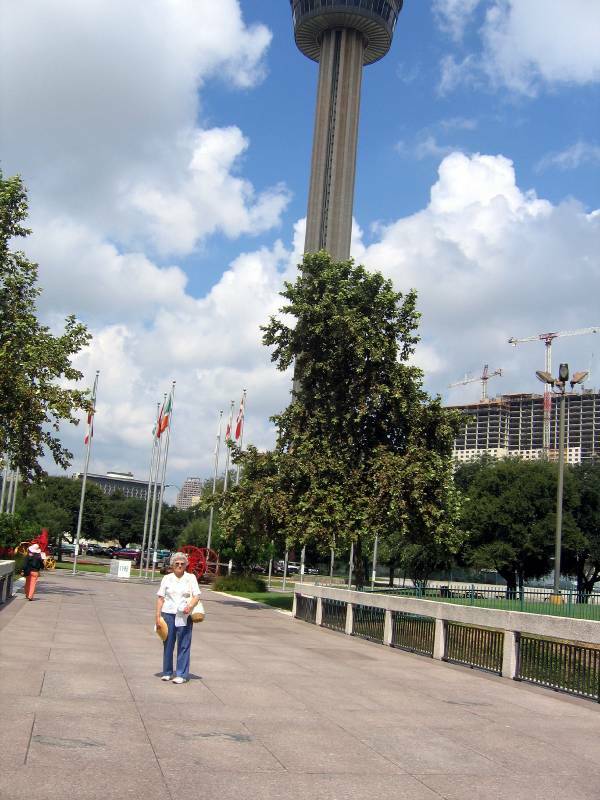 San Antonio hosted a "HEMISFAIR" way back in 1968. Our family was driving in our camper to the East coast to visit relatives, and see the country en route. So we arranged to stop for a day and visit the fair. It was very exciting. 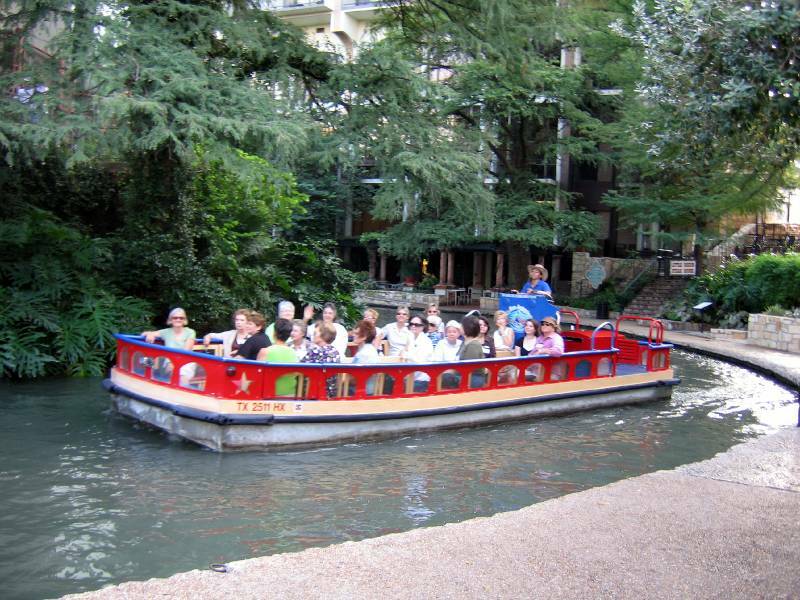 Now we found that the Hemisfair site was a short walk from our hotel, so we went there one morning. The tower is still a major attraction, but we did not go up. 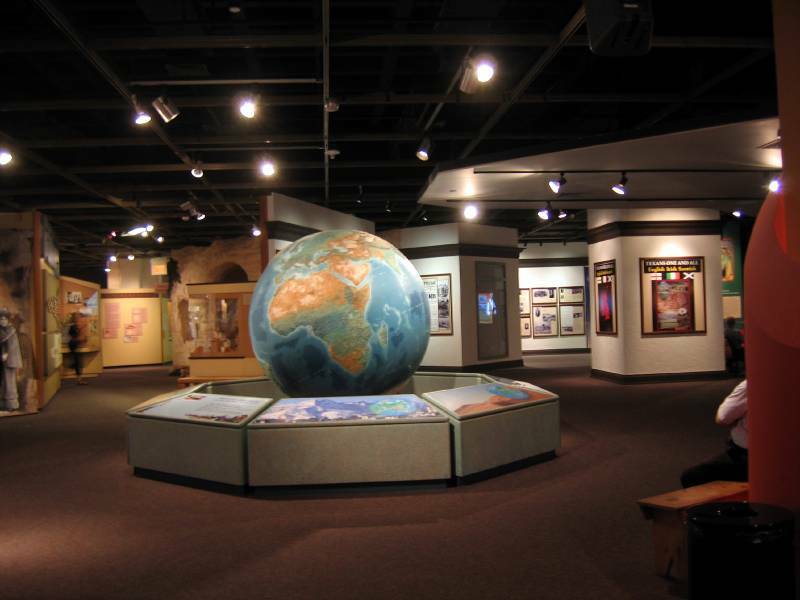 Instead we went into the University of Texas Institute of Texan Culture. most of the displays were unchanged since the fair, but some new ones had been added. 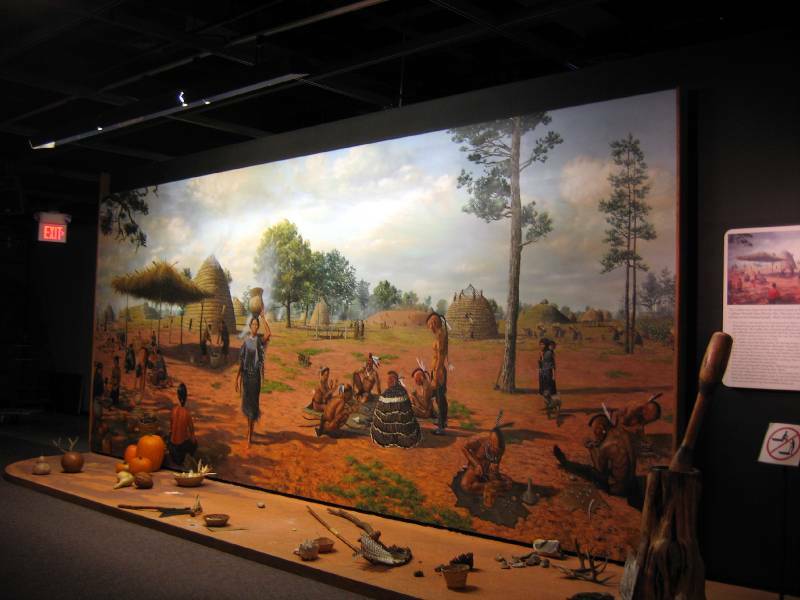 There were sections devoted to the cultures of the home countries which had been the source of the Texas immigrants. For example there were sections on Ireland, Poland, China, etc. They were very well done. 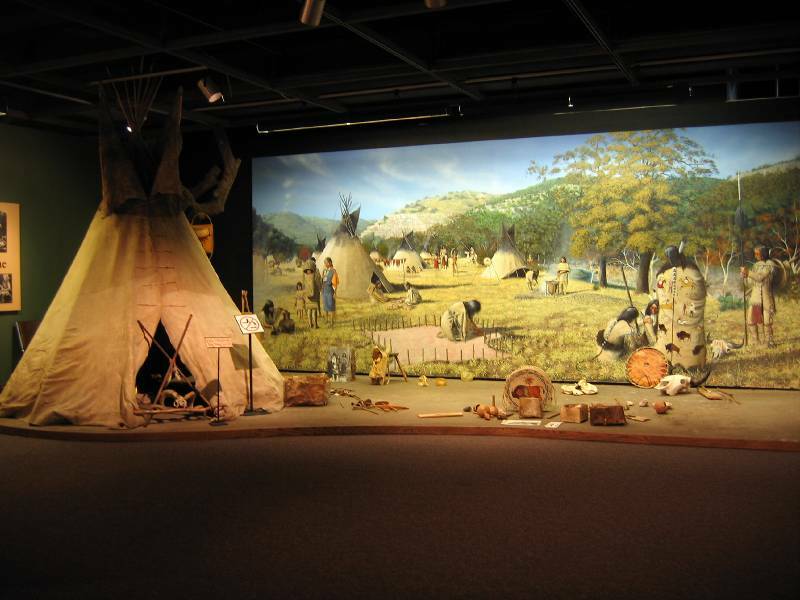 The section for the Native Americans was extensive and very well presented. There was a large group of small school children sitting on the floor geting demonstrations of fire starting when I first came to this display. They had moved elsewhere when I returned to get this photo. 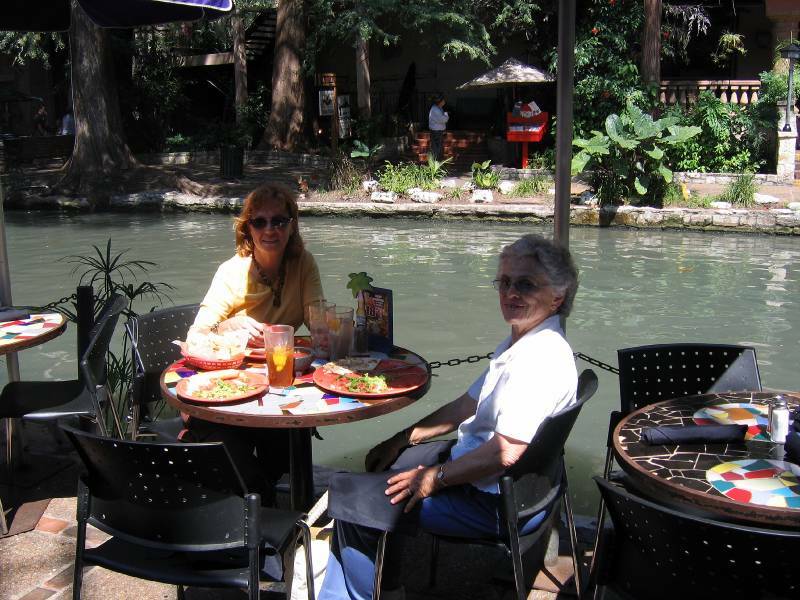 Brigid lives in San Marcos, and works in San Antonio, so we were fortunate to be able to have her meet us for lunch on the River Walk. By the way, before I forget, I would like to publicly thank Texas for the wonderful weather that they provided for us. Ten straight days of beautiful sunshine, although the area was plagued by lots of rain and flooding earlier this year. The waiter took this photo. We had a grand time "chewing the fat" with our dear Niece. But more later. In the early 1800'sthe Mexican Government went to great lengths to encourage settlers from Europe, US, etc. because they wanted to protect their claim to the territory from the French. This backfired on them when the settlers declared independence, and created the Republic of Texas. They, in turn, encouraged immigrants from Europe. A number of groups came over and settled together. 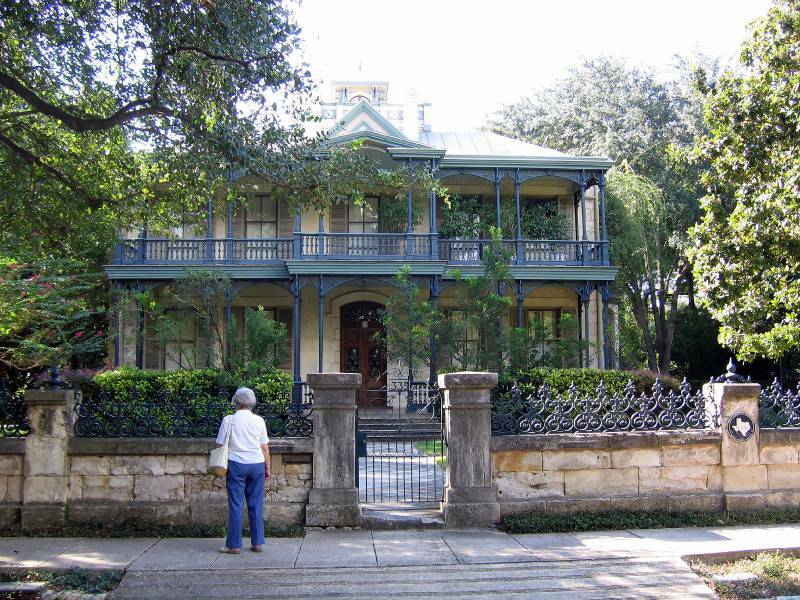 Many of these, particularly the Germans became very wealthy, and a number of them settled and built large mansions in this part of San Antonio known as the "King William Street Historic District". It was very well preserved, and we took a self guided tour. 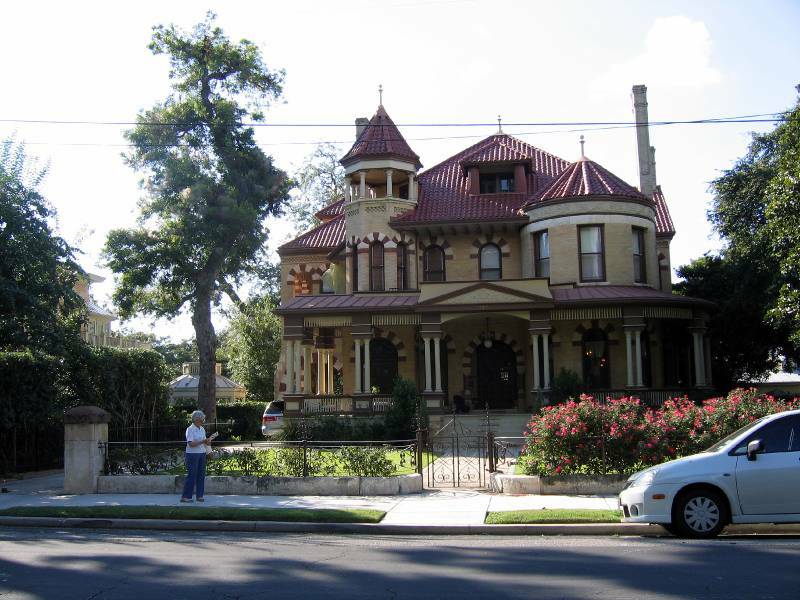 Here are a couple of these historic homes. They all seem to be occupied and well cared for. Well, maybe some wre better than others. 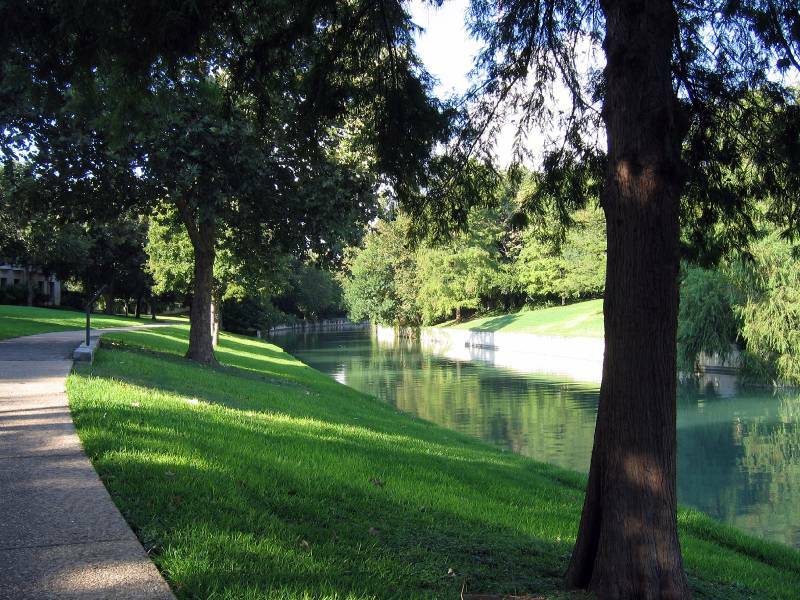 The King William district is situated along the shores of the lower river, and as you can see, there is a beautiful walk and landscaping along the river. It is very serene and quiet, and a great place for strolling and jogging. We walked back along the river to within 2 blocks of our hotel. We took a nap and then had a nice dinner -- you guessed it -- along the River Walk. What is this, you ask, and what does it have to do with Texas? 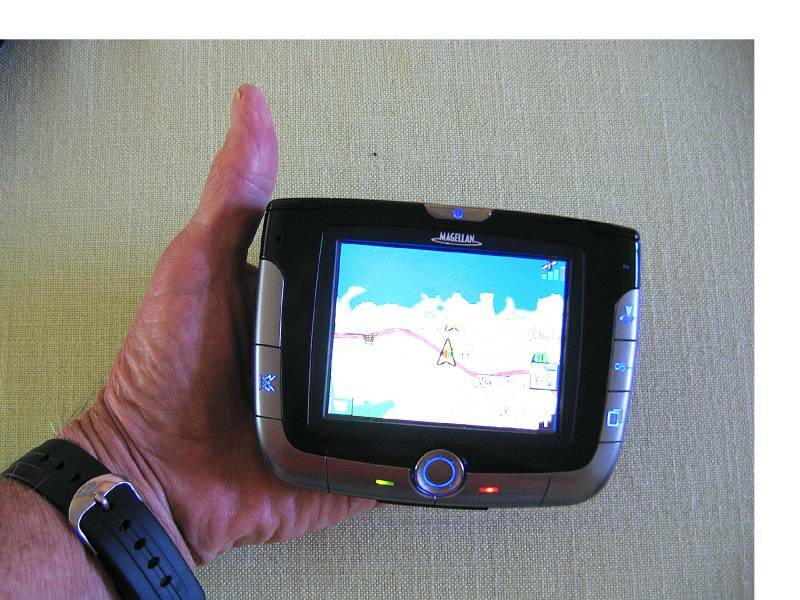 It is aself contained battery powere "GPS NAVIGATOR", which utilizes the GPS satellites, internal computer data bases and maps to help one find one's way to a specified destination. We bought it because my poor vision no longer lets me read street signs, maps, directions, etc. And, of course, Marie has to do the driving. She can't look at maps when we get lost on a city freeway. The huge advantage of the navigaror is that it speaks the instructions, such as "prepare to turn left in 1.4 miles" etc. So it was to play a very large role in our driving excursion. All one needed to know was the address of the destination that you wished to go to. Our AAA tour guide had addresses for everything of interest in Texas. The next morning we walked to the Marriot and rented our cute Toyota Corolla, drove back to the Hotel, checked out and drove about 50 miles to a delightful small city named FREDERICKSBURG. It was founded by a large group of Germans in the mid 1800s, and maintained a very strong German character till well through the 20th century. There are still some fine German restaurants there, which we sampled and liked. 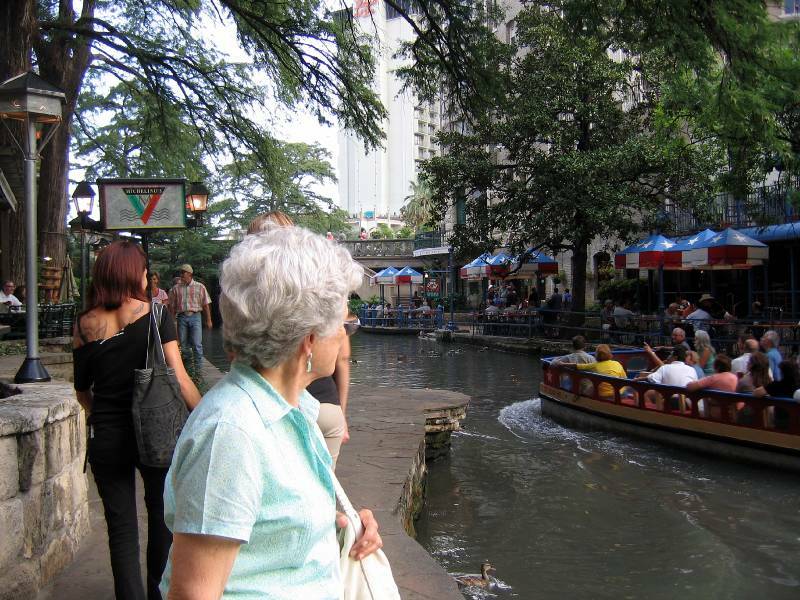 This city is reported to be one of the top places to retire! 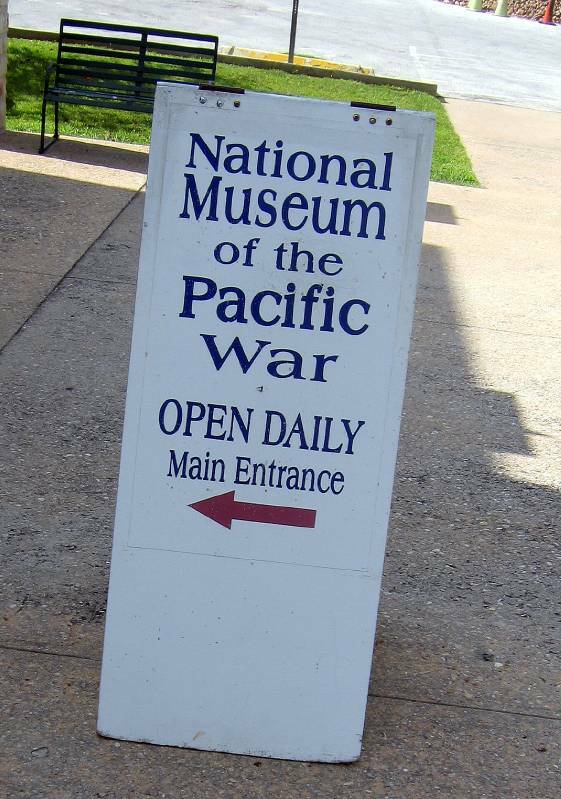 Believe it or not, this museum, dedicated to memorializing the War in the Pacific, is located here in the small city of Fredericksburg in the heart of the Texas Hill Country. I must say that I would have expected it to be in San Francisco or San Diego, but why here? Read on. 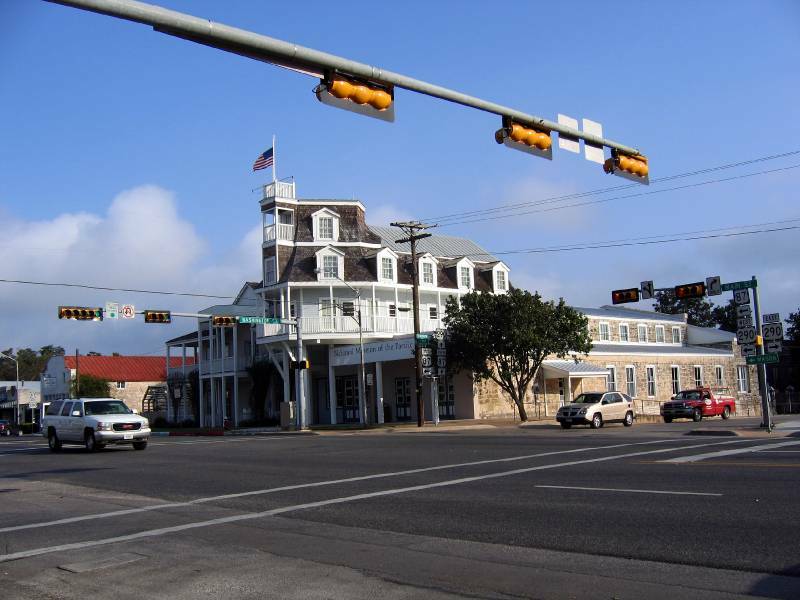 This is a very famous old Inn/Hotel that was founded in the mid 1800s by a pioneer named Nimitz. Ring a bell? He had a grandson who was born and raised here, and whose name was Chester Nimitz. Ring a bell yet? Well, he went to Annapolis and rose in the Navy to become the top Admiral for the whole Pacific War. He retired back to this town, and the citizens, who were very proud of his achievements, started a museum regarding his life. But the ideas started to grow, and artifacts and money poured in, including a big chunk from retired President George H.W. Bush, who was a pilot in the Navy and saw a lot of action in the Pacific. It is still growing and they are about to break ground on a large new building. The old hotel that is shown above is just the Nimitz family museum, one part of the overall museum. 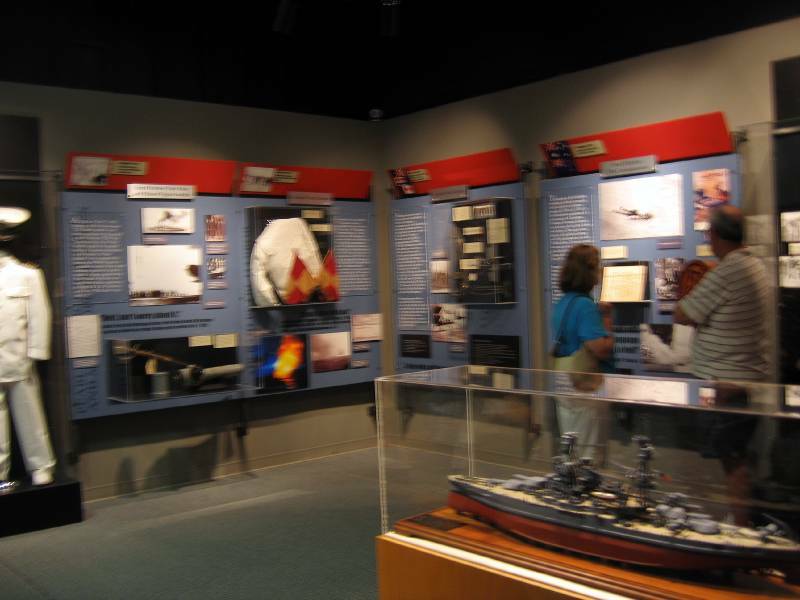 Another part of the museum, called the "Combat Museum" is located on a large property several blocks from the Nimitz Hotel, where the large items are displayed. 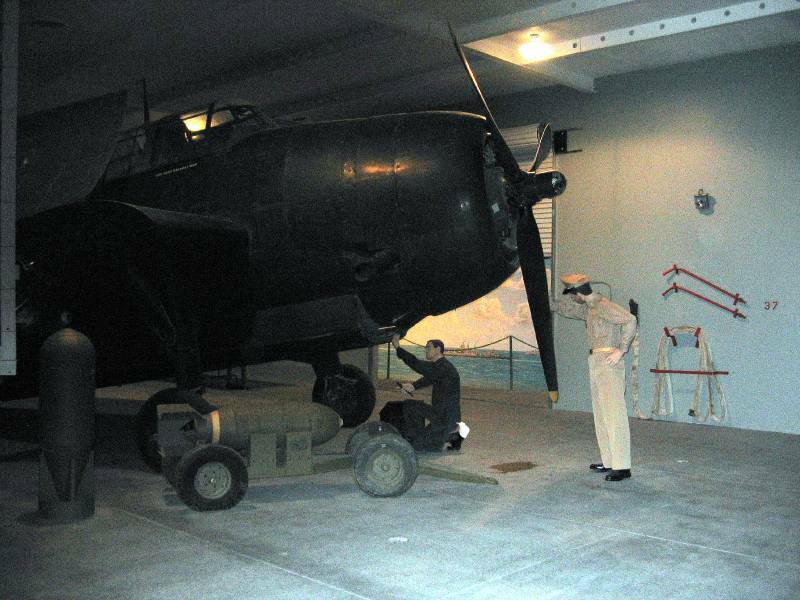 Two are located inside special buildings, The photo above represents part of the hangar deck of an aircraft carrier. A movie was shown, and then we saw this airplane which I believe represents the plane that George Bush flew. There are a lot of outdoor displays, arranged to simulate a typical island wartime envioronment. 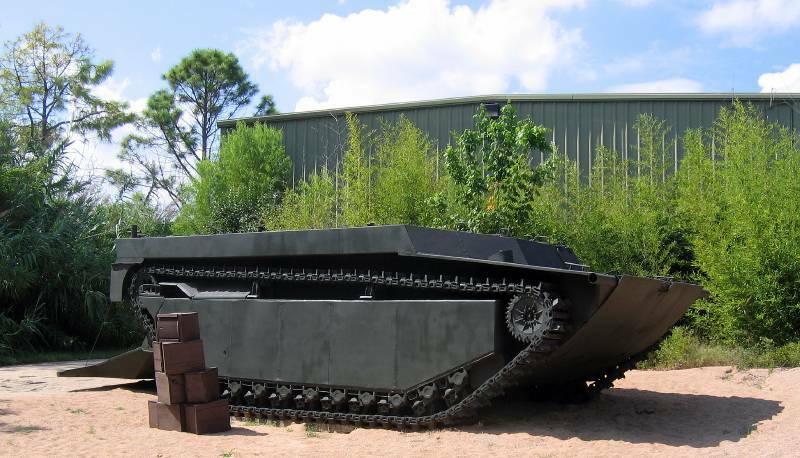 This is one of the amphibious vehicles that were used so successfully in the landings. Part of the exhibit represents the Japanese defenses that the Marines/Army would be facing. 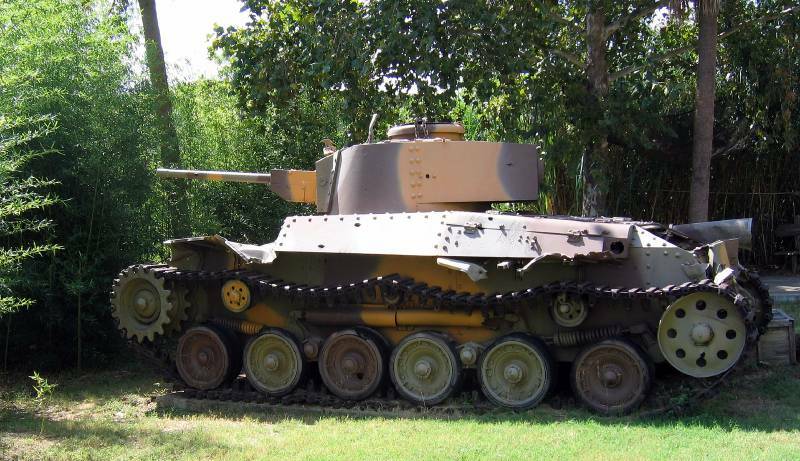 This is a medium Japanese tank. 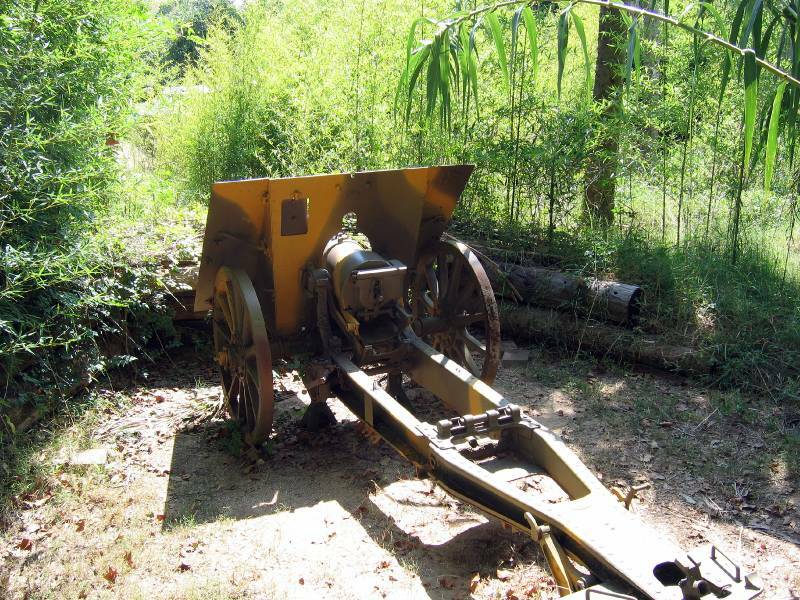 This is a Japanese artillery piece. The guide pointed out the light construction with wooden wheels, which made it more easy to move and point. Now we are about to enter the Large New building, that is near to the Nimitz Hotel. 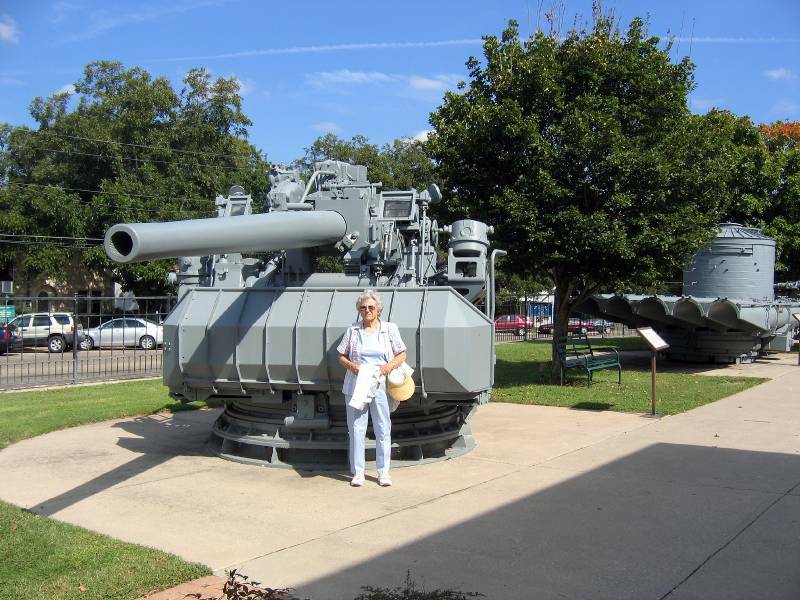 This is typical of the Guns that would be put on Merchant ships. This will just give you a flavor of the displays in the new building. It was arranged in a general chronological order, with many beautiful artifact and photos. 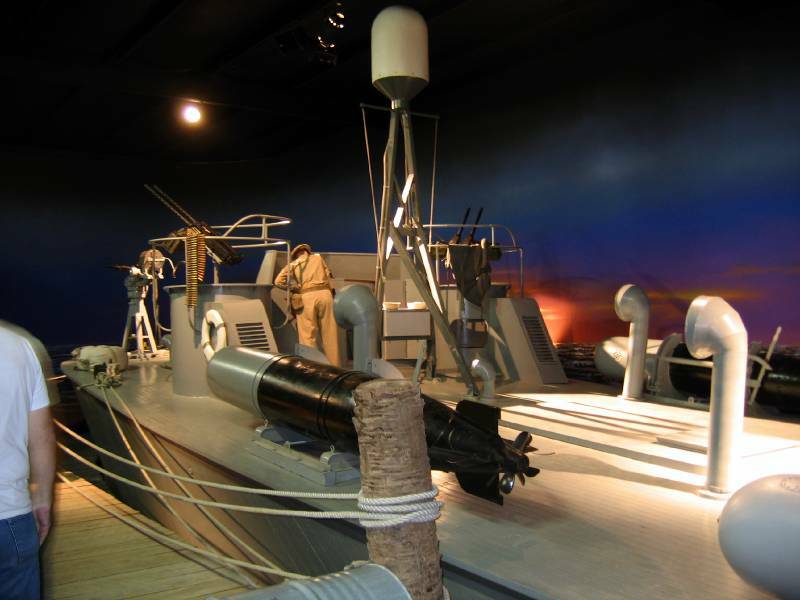 Interspersed were a number of large displays recreating some Pacific War scenes, and using real items. This scene is recreating General Jimmy Dolittle's famous B-25 bombers taking off from the USN ENTERPRISE on April 18, 1942 for the bombing of Japan. 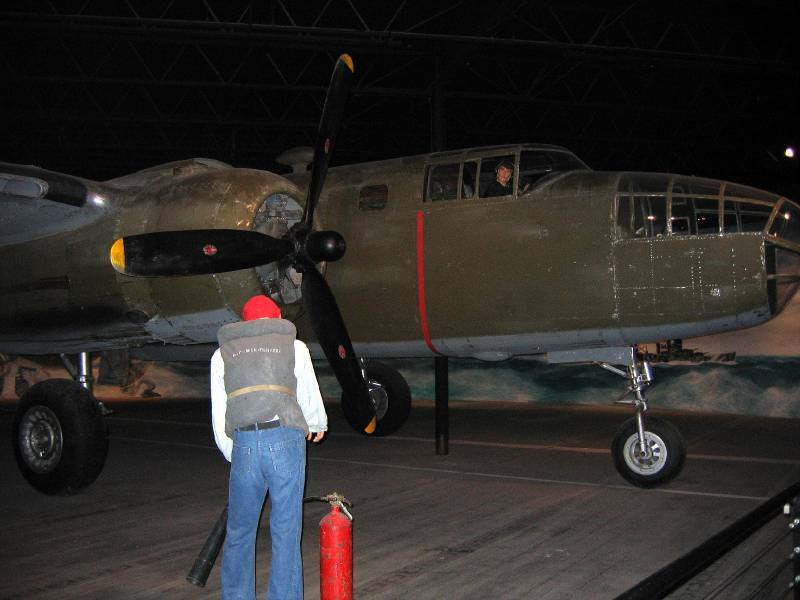 It gave a wonderful boost to the morale of the Americans since it was the first strike back since the Pearl Harbor attack. 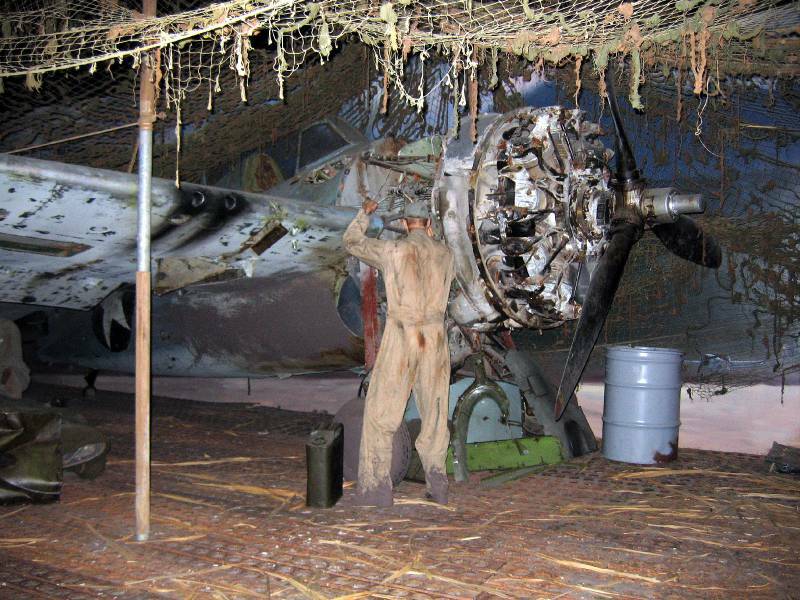 This displays some of the typical conditions for maintaining the aircraft. After the Museum closed we drove to wonderful little restaurant in an old house on the main street. 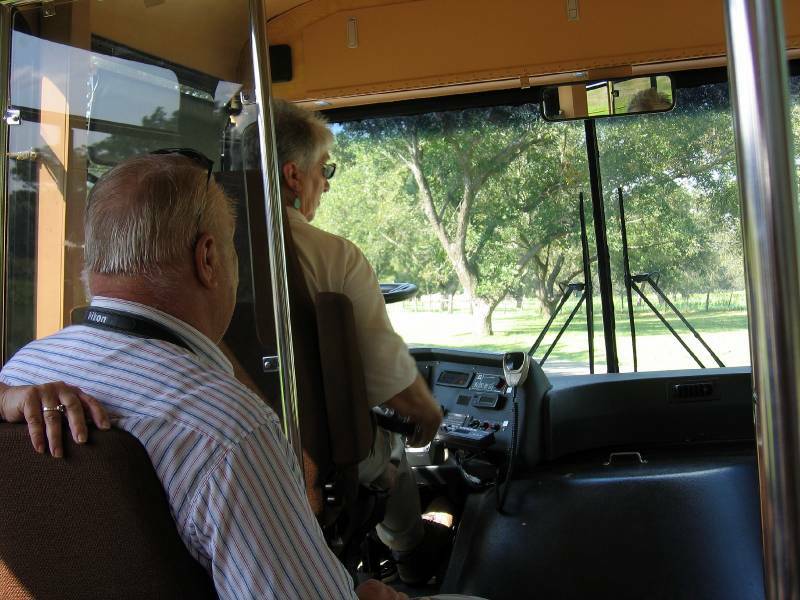 The next morning we drove maybe 50 miles to the tiny town of "Stonewall", where we went to an excellent Visitor center, and then boarded a bus for a guided tour of the "LBJ Ranch"and nearby related historic sites. Our lady bus driver did a fine job both as a driver and guide. The first place we stopped was this beautiful home where President Lyndon Baines Johnson was born in 1908. His family moved to a house in nearby Johnson City when he was quite young. See below. 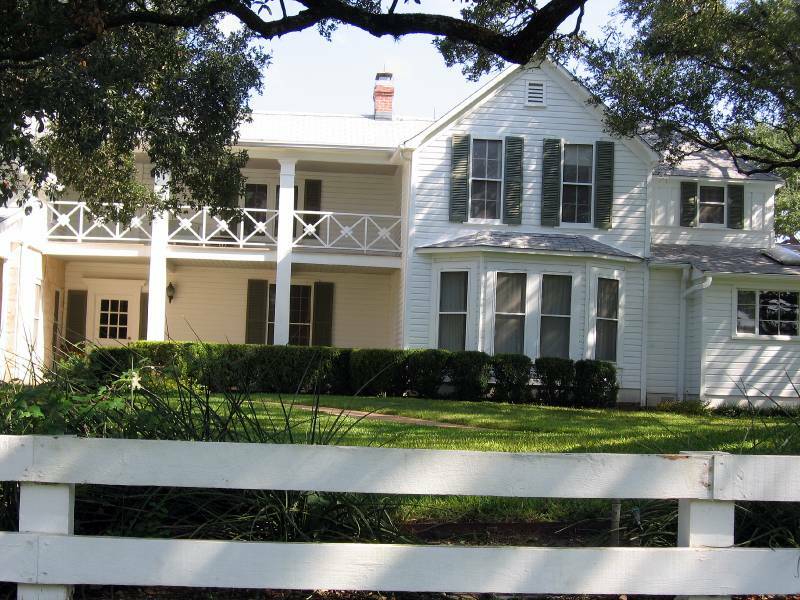 The house was charming, and I was impressed by how it was laid out to maximize the cooling breezes in that hot Texas summers, that we experienced first hand. But I wondered how this open arrangement worked during the winter blizzards! Another view of the Birth House. 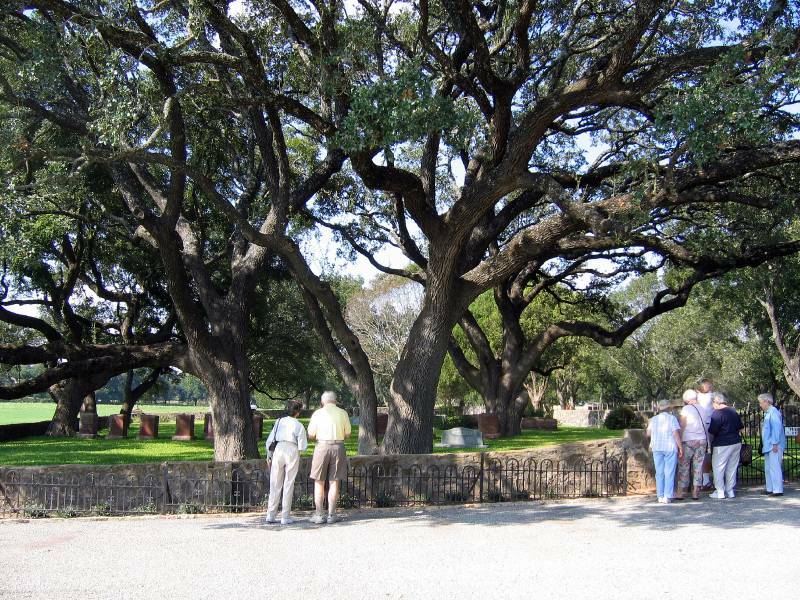 A short walk away is the Johnson family cemetery, located under these fantastic huge Live Oaks. 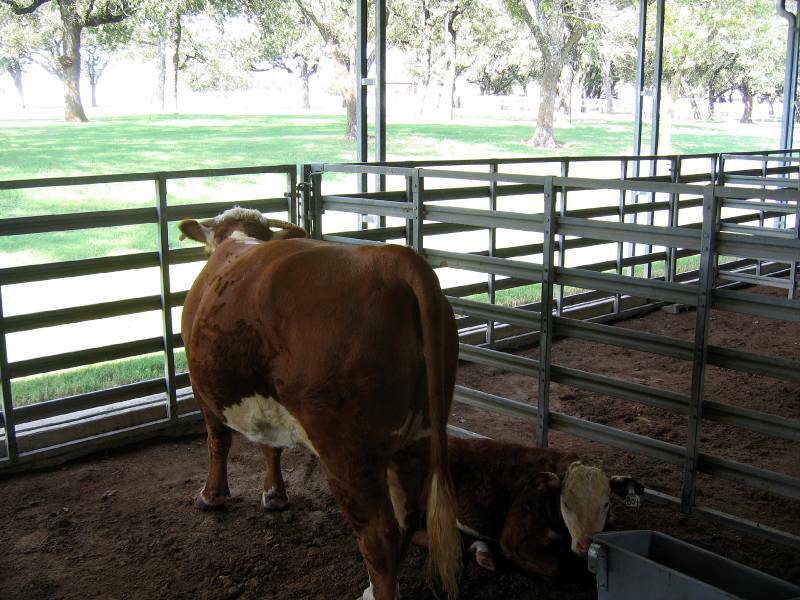 LBJ's grandfather raised cattle and drove them up the trail to Abaline Kansas, where they sold for prices that were about 7 times what the cattle would fetch here in Texas. I believe that most of the Johnson family is buried here. I am told that that the Large stone is his marker, and that he is buried between the two women who wre most important in his life, his Mother, and his wife, Lady Bird. 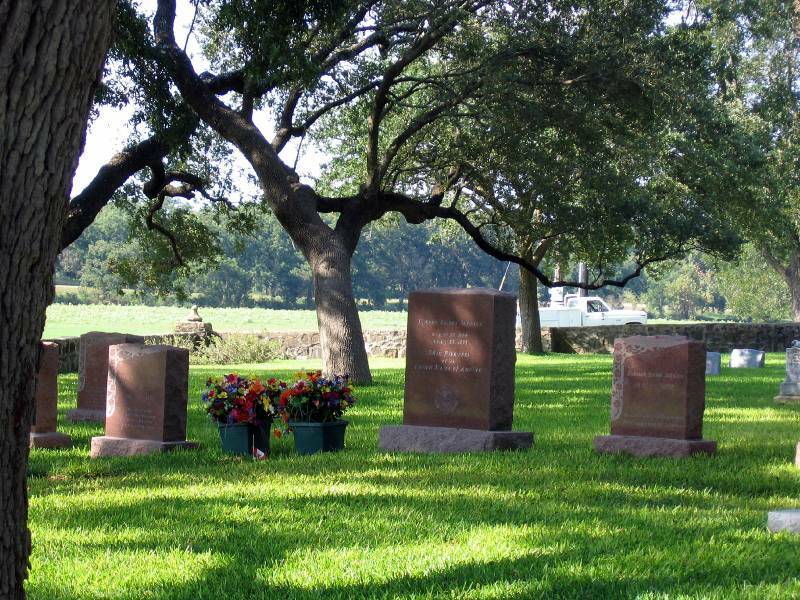 After he retired to his nearby ranch, he would enjoy walking out to this little graveyard in the early mornings. 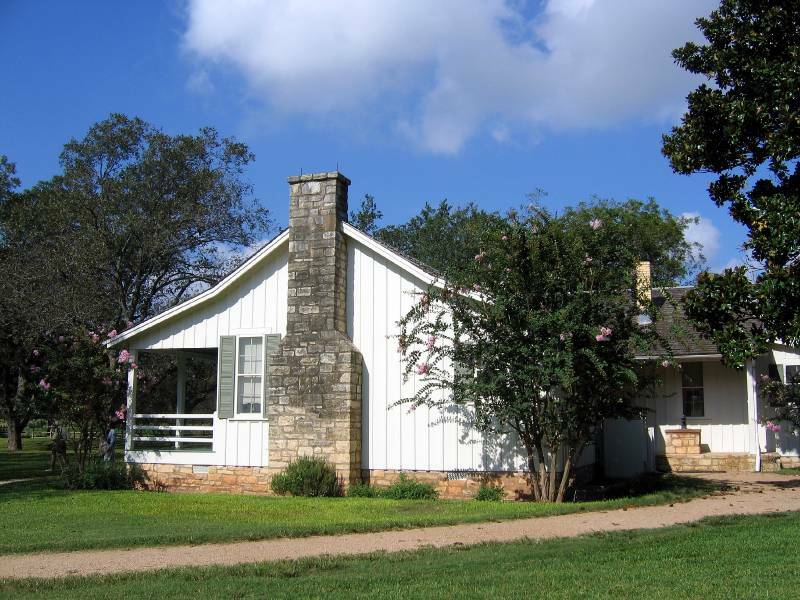 This is the main house of the LBJ RANCH. He bought it from a relative in the mid 1900's, and it was his favorite place. 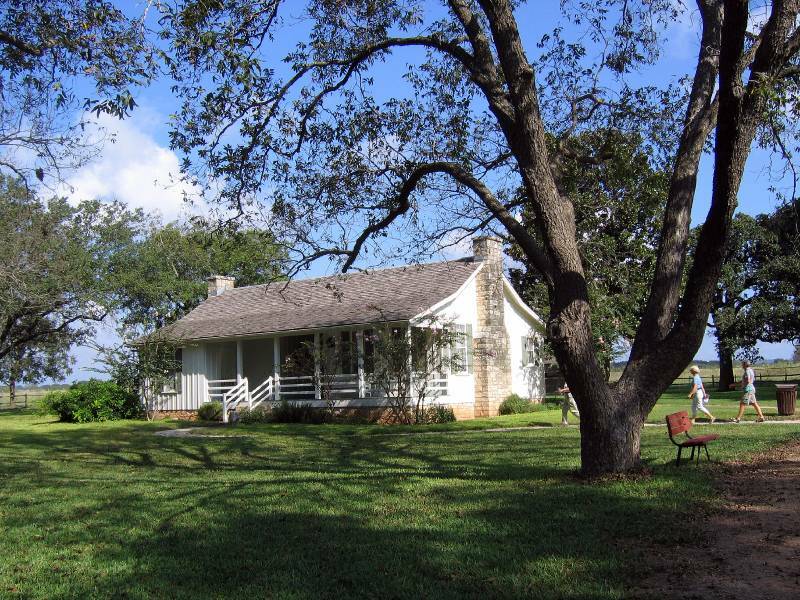 It became the "Texas White House" after he became President. He invited many heads of state, dignitaries, etc. here during that time, and well into his retirement. He really enjoyed driving them all around the ranch in his car. Just look at this fantastic Live Oak in the front yard. 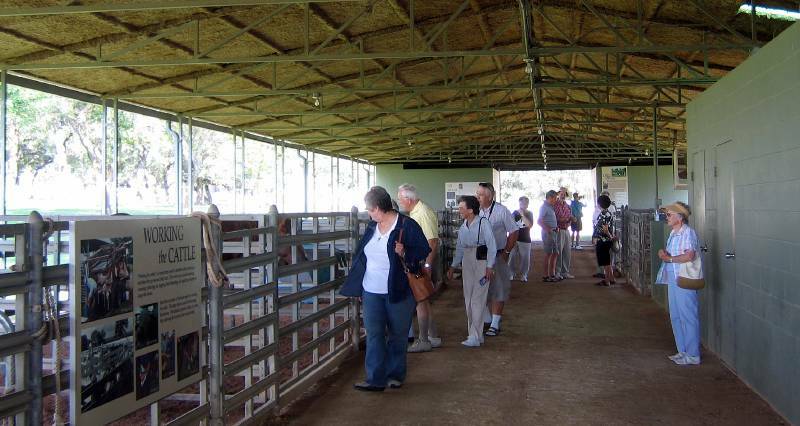 This is a "show barn" that he built to exhibit his prize cattle. It was designed so that he could drive his guests in his convertible down the center isle, with the cattle stalls on both sides. The ranch was not profitable operation most years, although he tried . I just could not get the critter to turn around! I am very happy that it did not raise it's tail and contribute to Global Warming!! 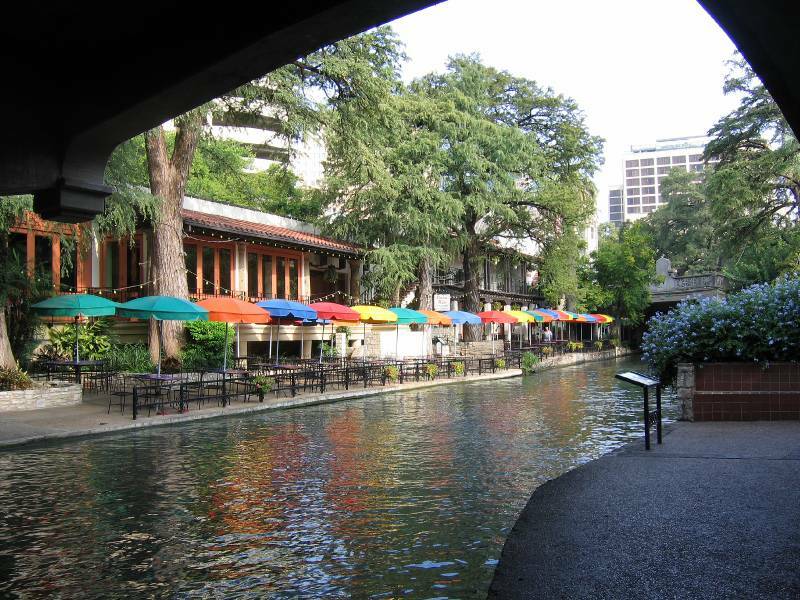 I had no idea San Antonio was so beautiful, the riverwalk is absolutely gorgeous. Wow, what a beautiful place; I've read about "Chesty" Nimitz and John F. Kennedy's dangerous swim from the PT boat. Thanks so much for taking so much time. This photoblog is more than just your trip, it's like a tour of the places you've been to. It's great!